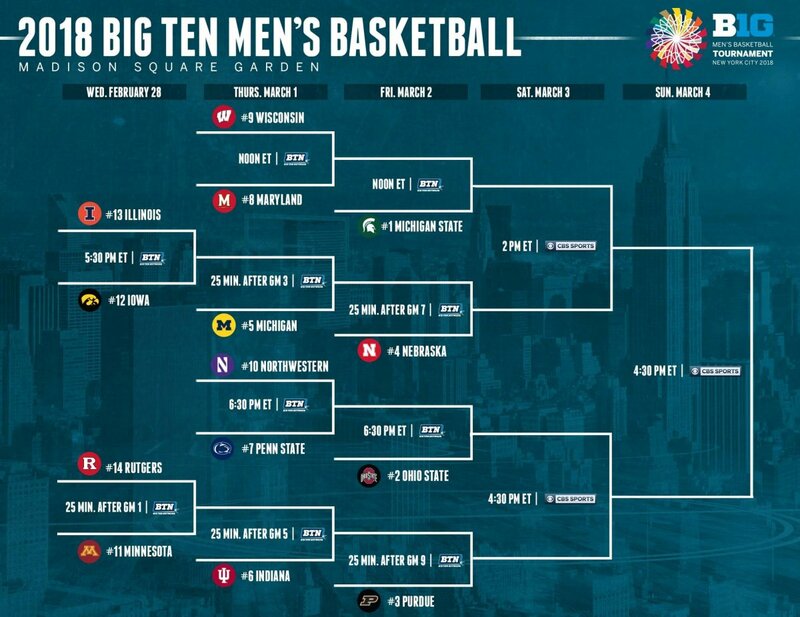 Yes, it's not quite March yet, but the men's basketball postseason tips off Wednesday night as the Big Ten begins its conference tournament a week early from Madison Square Garden. The conference hasn't quite had the year some thought it might, as only four teams currently appear to be a lock for the NCAA Tournament come Selection Sunday. Michigan State, Michigan, Ohio State and Purdue will all likely make the Big Dance regardless of what they accomplish or don't accomplish in the league tournament. However, bubble teams such as Nebraska and Penn State will likely need to win two or more games to make the 68-team bracket, a feat that won't come easy. With the tournament kicking off at 5:30 p.m., we take a look at the top 10 seeds in the tournament, the seasons they have had and what they will need to do to make a run in the Big Ten Tournament this week. From there, we will take a look at the two matchups on the opening day of the tournament that feature the bottom four schools in the conference. Bracket courtesy of the Big Ten. The Spartans are right where most though they would be at the beginning of the season, and that is regular season league champs and the No. 1 seed in the conference tournament. Despite dropping early conference contests to Ohio State and Michigan, the Spartans are currently riding a 12-game winning streak and are among the hottest teams in basketball right now. Miles Bridges shocked everyone in the offseason by coming back for his sophomore season, and while there has been some controversy surrounding his eligibility amid the FBI probe in the college hoops, it appears all is cleared up and he and his team can put all of their focus on the tournament. Bridges was an unanimous first team All-Big Ten selection as a sophomore, averaging 16.8 points and 6.9 rebounds per game, and has Michigan State ranked No. 2 in the most recent Associated Press poll. From top to bottom, the Spartans are as talented as anyone in the country, and forward Jaren Jackson – the Big Ten Freshman and Defensive Player of the Year – is a projected lottery pick in the upcoming NBA draft. It would be hard to pick against Tom Izzo's squad in the conference tournament any year, but especially this season. First opponent: Winner of the No. 8 Maryland vs. No. 9 Wisconsin matchup, Friday at noon on BTN. The Buckeyes enter the conference tournament boasting both the Big Ten Player and Coach of the Year, as Keita Bates-Diop and Chris Holtmann have led one of the more improbable success stories of the 2017-18 season. Ohio State was one game away from winning a Big Ten regular season title following a season in which it was picked to finish outside the top 10 in the league, and the Buckeyes' story isn't finished just yet. The Scarlet and Gray have picked themselves up off the mat after back-to-back losses to Michigan and Penn State, and have momentum again going into the conference tournament. With Jae'Sean Tate and a veteran group leading Ohio State, the Buckeyes have a legitimate chance to make a run to the final, but will need to get consistent play from their guards in order to do so. First opponent: Winner of the No. 7 Penn State vs. No. 10 Northwestern matchup, Friday at 6:30 p.m. on BTN. The Boilermakers led the conference standings for the majority of the season, but a three-game losing streak to Ohio State, Michigan State and Wisconsin ultimately dropped them all the way to third place in the Big Ten. Matt Painter's team did, however, get back on track as Purdue ended the regular season on a three-game winning streak and got star forward Vincent Edwards back from injury. Purdue enters the tournament ranked higher than Ohio State in the AP poll (No. 8), and are led statistically by point guard Carsen Edwards, who was the lone Boilermaker to be named a first-team All-Big Ten selection after pouring in 18.2 points per game as a sophomore. Center Isaac Haas provides the Boilermakers with a size advantage over most big men in the league, while Dakota Mathias is one of the conference's top sharp-shooters. First opponent: Winner of No. 6 Indiana vs. No. 11 Minnesota/No. 14 Rutgers matchup on Friday, following the 6:30 p.m. game on BTN. The Cornhuskers sit firmly on the NCAA Tournament bubble, despite earning a double-bye in the Big Ten Tournament. Nebraska's best win of the year was a 20-point win over Michigan on Jan. 18 at home, but the Cornhuskers are without a second signature win. Tim Miles' team came close on a number of occasions, losing to Kansas by just one in non-conference play, and losing by just five on the road to Ohio State in late January. The Cornhuskers also have a handful of bad losses this season, losing games to St. John's (14-15) and Illinois (14-17), albeit both on the road. Nebraska has premier talent on its roster, including first-team All-Big Ten coaches' selection James Palmer Jr., who was considered one of Bates-Diop's competitors for Big Ten Player of the Year. Palmer Jr. averaged 17.4 points per game this season and has shown the ability to carry the Cornhuskers against premier programs if needed. First opponent: Winner of No. 5 Michigan vs. No. 12 Iowa/No. 13 Illinois on Friday, following the noon game on BTN. John Beilein's group is riding a five-game winning streak entering the tournament, the second longest streak in the Big Ten, behind only Michigan State's 12-game streak. The Wolverines missed out on double-bye in the tournament after losing their only matchup this season against Nebraska, but could get another chance at the Cornhuskers if they win their second-round game. The Wolverines are the defending conference tournament champs, after winning four games in as many days last season in Washington D.C. to take the trophy. Michigan has been led this season by center Moritz Wagner, who was named a second-team All-Big Ten selection after averaging 14.4 points and 7.2 rebounds per game this season. The Maize and Blue have also received major contributions in recent games from freshman Jordan Poole. Poole has scored in double figures in his last three games after averaging just 6.7 points per game all season. For the Wolverines to repeat as tournament champions, Poole and Michigan's bench will need to continue to produce. If that keeps up, Michigan is a legitimate contender to get back to the championship game on Sunday. First opponent: Winner of the No. 12 Iowa vs. No. 13 Illinois matchup Thursday, following the noon game on BTN. The Hoosiers struggled in the non-conference schedule, dropping home games to Indiana State and Fort Wayne University – both by 20 points – before the turn of the calendar. Since then, however, Archie Miller's squad has found some success in Big Ten play. Indiana won four of its last six conference games of the year, despite losing its last two to Nebraska and Ohio State. Forward Juwan Morgan was named a second-team All-Big Ten selection after averaging 16.6 points and 7.3 boards per game this season. Against Ohio State in the regular season finale, Morgan dropped in 18 points, his 11th straight game scoring in double-figures. For the Hoosiers to make a run, Morgan will need to dominate the paint and Indiana guards Robert Johnson, Devonte Green and Josh Newkirk will need to keep opposing guards from penetrating the driving lanes. With De'Ron Davis out for the season, Indiana lacks elite size, which has hurt them this year. First opponent: Winner of the No. 11 Minnesota vs. No. 14 Rutgers matchup Thursday, following the 6:30 p.m. game on BTN. The Nittany Lions looked primed to make a run at an NCAA Tournament appearance after trouncing Ohio State, 79-56, on Feb. 15. However, Penn State lost its final three games to end the regular season, including a 12-point loss to Nebraska in the regular season finale. Tony Carr, who was a thorn in Ohio State's side all season, was named a first-team All-Big Ten selection after leading the conference in scoring, pouring in 19.9 points per game. Carr also averaged 4.5 rebounds and 4.8 helpers per game this season, as perhaps the most electric player in the conference. Penn State was without forward and leading rebounder Mike Watkins (8.9 rpg) in its loss to Nebraska, and should he miss time in the Big Ten Tournament, the Nittany Lions could have trouble keeping teams out of the paint. First opponent: No. 10 Northwestern on Thursday at 6:30 p.m. on BTN. The Terps entered the season with high expectations, but the tone was set for Maryland's season when it traveled to East Lansing, Mich., and fell by an even 30 points to Michigan State on Jan. 4. That loss started a stretch where Maryland lost six of eight games to open the new year, and the Terrapins never recovered. Maryland's best conference win this season is a 75-69 win over Penn State to open the new year on Jan. 2, and its best non-conference win is a 79-65 win over Butler in the third game of the season. The Terps closed their regular season getting thumped by Michigan, 85-61. The Terrapins aren't without talent, however, as guard Anthony Cowan has shown flashes of brilliance, averaging 15.7 points and 5.2 assists per contest. Perhaps their most impressive player this season has been freshman big man Bruno Fernando, who averaged 10.2 points and 6.4 boards per game en route to being named to the Big Ten All-Freshman team. For Maryland to make a run, Fernando will have to dominate and sophomore guard Kevin Huerter will have to get hot from long range. First opponent: No. 9 Wisconsin on Thursday at noon on BTN. This season wasn't the kind of season we are used to seeing from the Badgers, who just a few years ago were competing for a national title. Wisconsin likely won't be playing in any postseason beyond the conference tournament this year, but the Badgers are playing their best basketball as the season winds down. Wisconsin got off to a horrid start in non-conference play, dropping three straight to Xavier, Baylor and UCLA before scoring just 37 points in a 12-point loss to Virginia on Nov. 27. The Badgers were then waxed at home by Ohio State on Dec. 2 and entered the new year with an 8-7 overall record. Recently, Wisconsin has played better, however, defeating Purdue, 57-53, on Feb. 15 before giving Michigan State all it could handle in the season finale, coming up just short in a 68-63 loss. The Badgers closed the regular season winning four of their last six after dropping five in a row at the end of January, bleeding into early February. The Badgers are led by veteran big man Ethan Happ, who was named a first-team All-Big Ten selection by the media this season, and freshman point guard Brad Davison who dropped 30 on Michigan State in the loss to the Spartans. If Happ establishes himself early in games, Wisconsin has a chance to earn an upset win or two with the way it's playing down the stretch. First opponent: No. 8 Maryland on Thursday at noon on BTN. The magic that surrounded the Wildcats last season appears to have worn off, as Northwestern, which was picked to finish near the top of the conference this year, has limped to a sub-.500 record in 2017-18. Northwestern earned its first-ever NCAA Tournament bid a season ago, and returned most of its cast from that team this year, but for whatever reason, it hasn't come together. Veteran point guard Bryant McIntosh has dealt with injuries for most of the season as the Wildcats have lost their last six games entering the tournament. For the Wildcats to make a run, McIntosh will have to play hurt, and re-emerge as the 2016-17 version of himself that led Northwestern to an NCAA appearance. Dererk Pardon will also need to dominate the paint on a consistent basis, something he has shown the ability to do throughout his Wildcat career. Scottie Lindsey also has the ability to get rolling, as he dropped 32 in the Wildcats' loss to Iowa to end the regular season. First opponent: No. 7 Penn State on Thursday at 6:30 on BTN. The Hawkeyes snapped a six-game losing streak on Sunday, with a 77-70 win over Northwestern in the regular season finale, to earn just their fourth conference win of the season. Iowa sophomore Jordan Bohannon drilled seven three-pointers in the win over the Wildcats and runs the Hawkeye offense, dishing out an average of 5.4 assists per game. Tyler Cook is far and away Iowa's best all-around player, however, pouring in 15.3 points and collecting 6.9 boards per game. The Illini ended the regular season by winning two of their last four, including an impressive win over Nebraska on Feb. 18. Illinois even got a player named to an All-Big Ten list, as point guard Trent Frazier was on the All-Freshman team after averaging 12.5 points per game. Junior forward Leron Black leads the Illini in points, dropping 15.7 per game. The lone game between the two schools this year went the way of Illinois, which won a 104-97 overtime contest in Champaign, Ill. on Jan. 11. Tip: 5:30 p.m. on BTN. The Golden Gophers have perhaps been the most disappointing team in the Big Ten this season. After entering the year as a preseason top-15 team, the Golden Gophers have endured a season of controversy and failure, limping to an 11th -lace finish in the Big Ten. Reigning conference defensive player of the year Reggie Lynch was suspended in January following allegations of sexual misconduct, and eventually left the team and university before the season was over. Explosive guard Amir Coffey dealt with injuries all season, and never appeared to be the same player he was last season. Minnesota has lost 10 of their last 11 games, the lone win coming against Iowa on Feb. 21. The Scarlet Knights have shown glimpses of finally becoming a competent conference opponent, but have yet to reach the next level. For the fourth straight year as a member of the Big Ten, Rutgers enters the tournament as the lowest seed. Rutgers has a pair of electric guards in Corey Sanders and Geo Baker, both of whom average double-digits in scoring. Sanders, in particular, looks like a potential future NBA player, with the ability to create his own shot of the dribble and score at will. Forward Deshawn Freeman provides the Scarlet Knights with tremendous toughness and rebounding, pulling down 7.2 rebounds per game and scoring 11.2 points per contest. Tip: 25 minutes after the conclusion of game one on BTN.